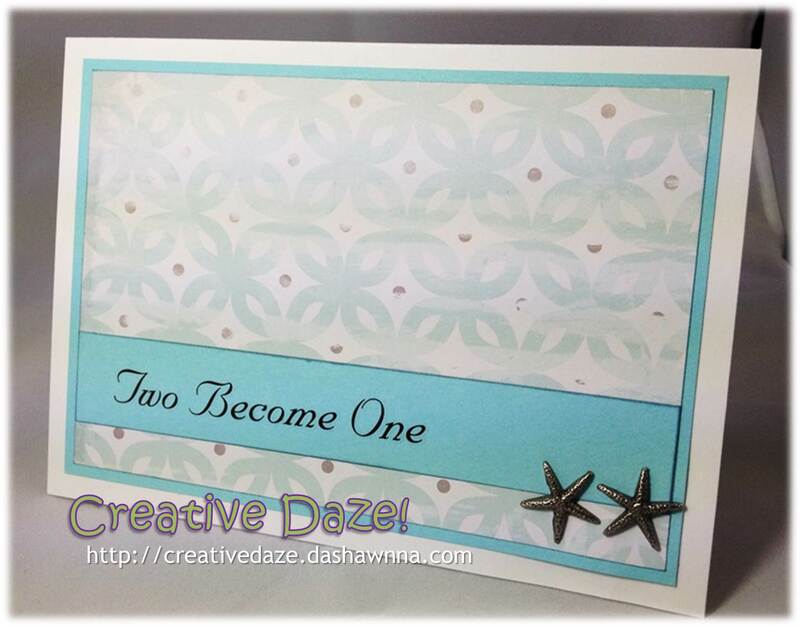 Two Cute and Simple Cards! 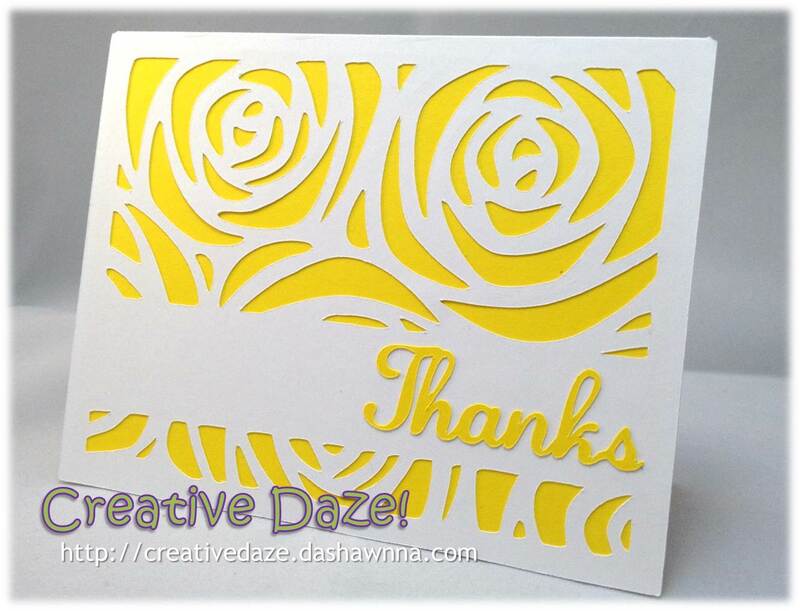 A couple of months ago, I was asked to create some thank you cards. Since I've really been feeling my mojo lately (LOL) I figured I'd better harness some of this energy and come up with a design or two! 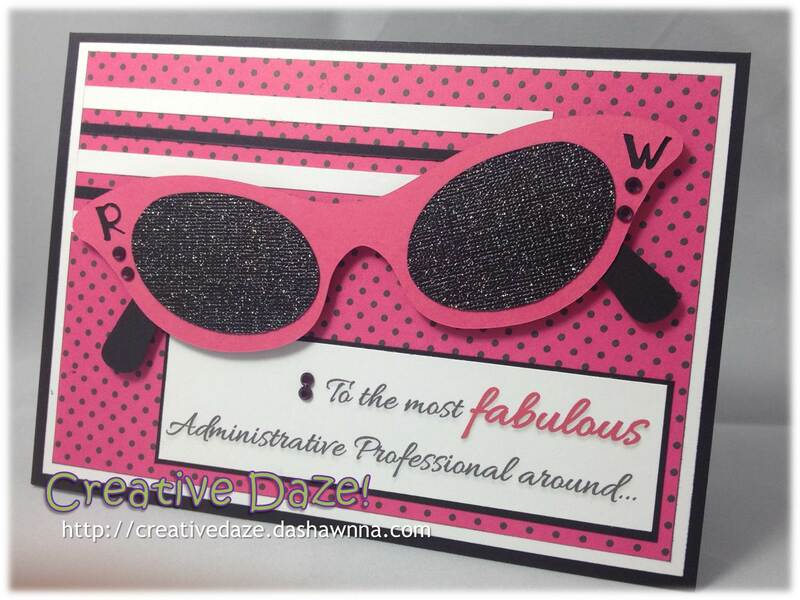 Wednesday was Administrative Professional's day! My office happens to have an absolutely fabulous admin professional --Regina!--so we took this opportunity to really celebrate her and her contributions! After organizing a nice breakfast, I knew that I wanted to make her a card so she would know how much we appreciate her. 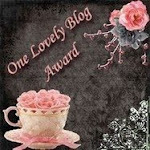 As the month of May approaches, so does the 2nd wedding anniversary of my other BFF! Two years ago, she and her husband had a beautiful sunrise ceremony on the beach. Time certainly has flown but I still remember that day with so much fondness and a huge smile- and their lovely wedding inspired this card! 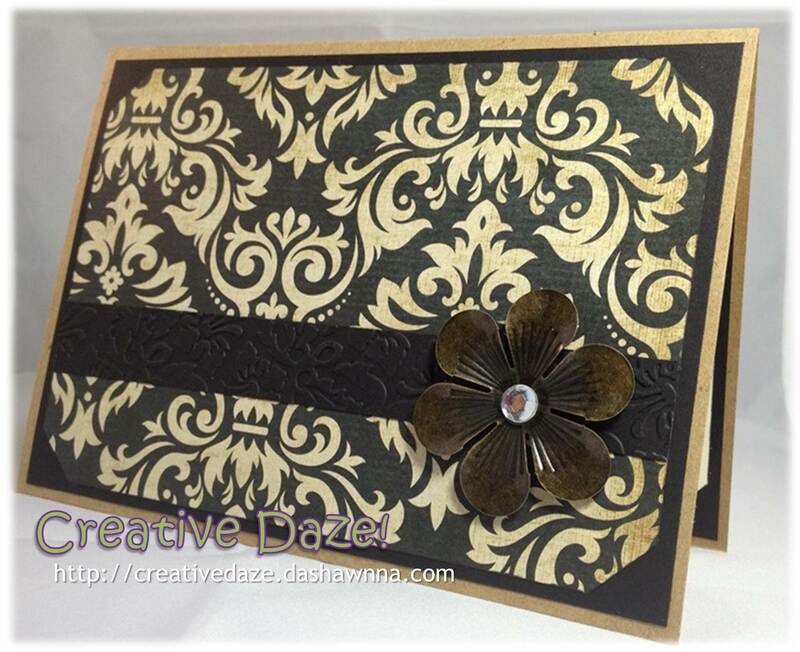 A piece of patterned paper by Recollections was the starting point for this beachy 5X7 card. Some sky blue cardstock and a little bit of inking around some edges got me half-way to the finish line. Then I found a package of marriage-themed rub-ons that I've had for years-- but the sentiment was just what a I needed. 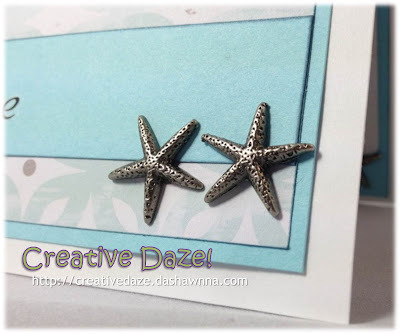 The final element that tied everything together for me were some brads in the shape of starfish! What could be more perfect for an easy, breezy, beachy card?! I also placed one of the brads on the inside of the card to finish it off. I hope my BFF and her DH enjoy this card and feel all of the love I've poured into it! Thanks for stopping by and I'll see you after my next Creative Daze! After sharing a picture of the anniversary card I posted yesterday, one of my friends asked me if it was a card or a notebook. 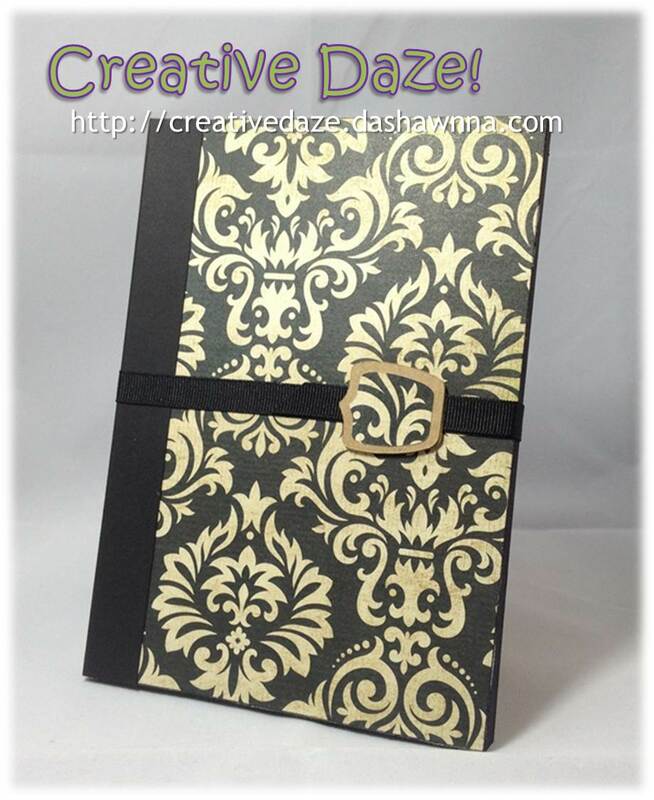 Her question sparked an idea and -subsequently- a Creative Daze! Using an 80-page journal from Michael's as the base, I pulled out another sheet of the Recollections Black and Tan Damask to cover it. 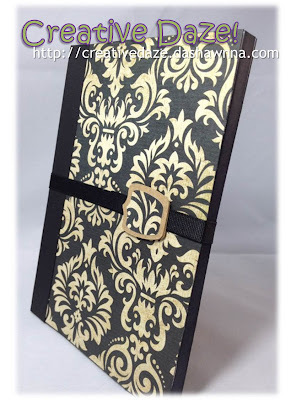 Some black card stock was used for the binding. For the ribbon closure, I used a tag from the Gyspy Wanderings Cricut cartridge cut at 1.25" (Kraft paper) and 1" (damask) and then layered them. I inked the edges of the book with Marcella black dye ink made by K & Company; I love the fact that the ink dries so quickly and doesn't smudge! For an impromptu project- I think it came out beautifully- and I think I'm keeping it for myself!! LOL Thanks for stopping by and I'll see you guys next time! Time is flying by and sometimes I feel like I can barely keep up! LOL It's been two years since *both* of my BFFs got married (one in April, the other in May) and it's time to celebrate their anniversaries!